Note: Response to April Challenge from KT -- "Forget April fools! You will find 4 pictures attached. Take a look at all 4 pictures and let 1, 2, 3 or all 4 inspire you. You don't have to be too bound by the details of the picture, all I ask is that the reader be able to tell which picture(s) you chose." I chose the fourth picture, the road….. He stood, staring down the tree lined road in confusion, unsure as to how he had gotten here. Before him, the road seemed to stretch on for an eternity, until it finally ended at a small, bright opening in the distance, as if onto empty sky. The light down there was gray, almost misty. Turning around, he found the road extended in the other direction much in the same way, except that, at the far end, the light was dark, as if it were night. If he squinted, he could make out something sparkling, like stars. Looking up, the thick tree branches formed a roof over his head, intertwining like fingers in clasped hands. They effectively shut out any light from above. To his left and right, the squat, black trunks crowded together, forming a wall to the fog enshrouded environment beyond…if there was anything beyond. 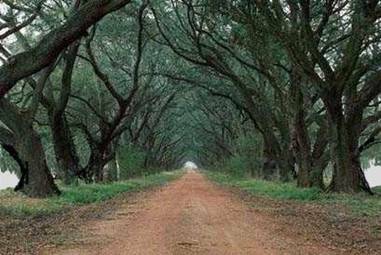 "Okay," he muttered, looking again down the road, his boots scuffing the red dirt at his feet, "Where am I?" The was a slight crack in his usually smooth drawl as he spoke. His fingers twitched at his sides, alternately clenching into fists and releasing, betraying the nervous energy growing inside him. All he knew for sure was that this road didn't exist in the West. The trees, the dirt, the misty light…reminded him of the Europe. "I assume," he said to the world at large, vaguely hoping that whoever had put him there would be listening, "that I am supposed to choose a direction." A gentle breeze swept through the branches overhead, rustling the leaves. He looked up, slightly surprised at the movement. The breeze grew stronger, and the branches dipped up and down. His eyebrows lifted, and he found himself crossing his arms defensively. "Assuming," he said, clearing his throat and talking to the trees now, "again, that that was not just wind, but a divine response to my question," he paused, still looking upwards, "then I expect I am supposed to choose between either the way of Light or of Dark. Black or White. Goodness or Evil. Heaven or Hell. Is that the general idea?" The wind blew again, the branches lifting up and down. He gave a crooked smile, his dimples growing. He looked up towards the light end. "Obviously, then, I am supposed to choose the light," he said, almost conversationally, "but, well," he turned to look at the dark end, "I have always considered myself something of a night owl, and perhaps I would be more comfortable in the dark. After all, what is that saying about the road not taken…?" The wind that blew through the trees was much harsher, almost like a mini hurricane, shaking the branches so that they creaked and moaned, as if angry. Eyebrows lifted again as he looked up. "Ah. I take it you do not want me to choose the dark," he said to the unseen force. Then he shrugged, "But tell me, if I choose light, might that not condemn me to a life of piety and joyless virtue?" The branches responded as if to a gentle breeze, like an exasperated sigh. For some reason, the sound reminded him of Josiah. He nodded. "But if I choose darkness," he looked down the road towards the night sky, his voice a little sad, "then I expect I would be condemned to a life of debauchery, loneliness and despair." The branches didn't answer this time. Perhaps they thought the answer was obvious. He looked down at his feet. "See," he said, staring at the toes of his boots, "Problem is…I am unfortunately something of a contrary person." When he looked up again, his pale green eyes were narrowed, squinting at something to his left. "So...," his words sped up, "I think I'm going to go into the space to my left here. Hope you don't mind." He was moving even before he finished speaking, heading quickly towards the side. As soon as they understood his intention, the branches came alive with a frightening intensity, shaking up and down, left and right, blown by something very powerful…and angry. This was not how it was supposed to work! You don't leave the road! You can't go SIDEWAYS! He ignored them, his hand lifting to hold onto his hat against the harsh wind as he reached the edge of the road and ducked down to get under the branches. They raked at his back, forcing him almost to a crawl, slamming into his side and head as he pushed his way through them. Then, suddenly, he was on the other side. Behind him, the trees had stopped moving. He stood in a wide meadow, surrounded by wildflowers and long grasses, and, if he wasn't mistaken, the scent of wild roses drifted past his nose. Lazy sunshine warmed his shoulders, and birdsong greeted his ears. "Huh," He smiled, honestly surprised, as he looked around, "it actually worked." He lifted his foot to walk forward. And stepped right into a cow pat. "Aw, nuts," he muttered, lifting the foot out and stepping away, his other boot sinking into the muddy earth. The earth squelched beneath his feet as he walked a little further away. Shaking his head, he stared down at his boots in despair. They were going to get ruined. When he looked up again, he was standing in his own room over the saloon in Four Corners, everything shrouded in the darkness of night. He was dressed only in his nightshirt, his cold toes curling into the material of the rug under his bare feet. Green eyes blinked. Ezra nearly jumped out of his skin, his eyes seeking out the source of the words. As he turned, he winced, the motion having tugged on the still healing scars under the bandages securing his back and side. With sudden clarity, he recalled that he'd been badly hurt the day before…though he couldn't quite remember how. "What's the matter?" the voice said, a little peeved now. "You should be in bed." It was the annoyed tone that did it. "Hi Nathan," Ezra said, finally making out the shape of the man sitting on his rocking chair. The healer's arms lifted and he stretched, obviously having just come awake himself. The healer chuckled a little as he leaned forward, leaning his arms on his knees and bringing his face into the sliver of moonlight coming in through the window. "Hi Ezra," he responded, looking up at his friend. "What are you doing up?" "Oh," the gambler frowned, yes…why was he up? Then he smiled, remembering the dream. "I, well, interestingly, I think I was sleepwalking." "Yes," Ezra looked down at Nathan, blinking still. "Though, I admit, I don't think I've ever done it before. I was having a strange dream…." "You really should sit down," the healer said, watching as Ezra swayed ever so slightly. The gambler didn't hear him, the image of the road in his head again. "I was on this road," he said, "and I had a choice. I could either head towards the light or the dark." Nathan stood up with a groan and walked towards Ezra, taking his arm. "Light or dark, huh? Which did you choose?" As he spoke, he turned the gambler around and led him back to the bed. "I didn't," Ezra smiled. "I sort of went…sideways." "Yeah…and I ended up in this lovely meadow…smelling of roses." Ezra's smile was wistful as he recalled the image. Next to him, Nathan suddenly started to laugh. At first, it was just a chuckle, but it soon grew, and the healer could barely stand up straight he was laughing so hard, holding a hand to his stomach. Ezra arched an eyebrow up at him, and took the last couple of steps back to the bed himself, settling himself down carefully. He waited patiently for the healer to recover himself. "What's so funny?" he demanded, trying to decide whether he should be pleased or annoyed at such a reaction. Nathan shook his head, wiping the tears from his eyes, "Nothing…nothing…just…only you would think to go sideways when confronted with choosing between the road to heaven and hell…and come up smelling roses!" "Well," Ezra said, rubbing a hand across his tired eyes, "I did step in a cowpat." Nathan burst out laughing again, and Ezra found himself chuckling as well, though it hurt to do so. Soon he was begging the healer to stop, because it was infectious, and he was having trouble breathing. Nathan tried to stop, but between exhaustion and general punchiness, he just couldn't. His breath came in hiccups, and the two men were gasping for air by the time they managed to finally calm down. Ezra was barely aware when Nathan helped him finally lie back down, the healer patting affectionately the thick brown hair as he did so. His grin didn't fade until he was sitting back on the rocking chair, watching Ezra slip quickly into a deep, healing sleep. "Sideways," he muttered, smiling as his own eyes closed. "Only Ezra...."